So much a day, you start your computer to discover that the colors suddenly went blocky, ugly, or grained. The images which you work with on your computer disappeared very malicious (see Figure 1), and this photograph of your glances of niece of beauty queen as it was exposed to a skin disease of Star Trek. Figure 1. Has your display gone ugly? You should reset your color depth. 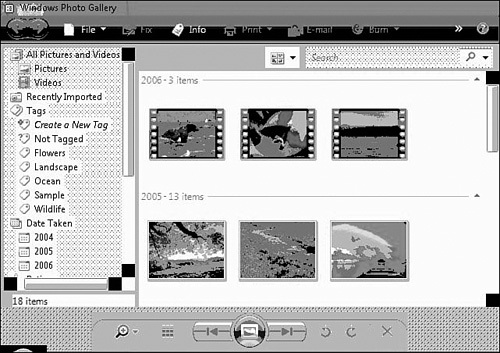 When your computer gets a case of the uglies, it can also prevent you from using your system effectively, especially if you’re working with photographs. So what’s causing it? Mice. Yep, mice are eating at your video cables. OK, maybe not. Actually, there are a few reasons why you might have problems with the quality of your display. One of the most common—and the easiest to fix—is related to something called color depth. 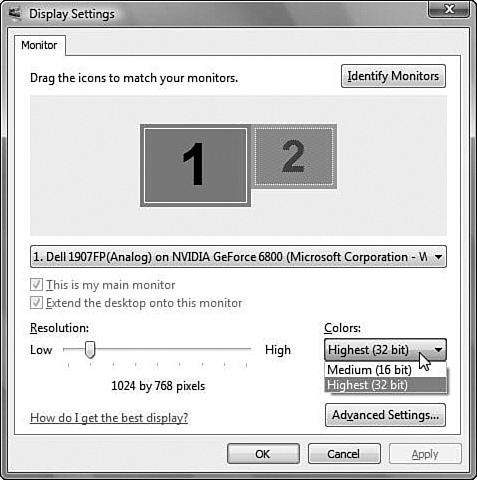 On a computer’s graphics card, each color is represented by a numerical code that correlates to shades of red, green, and blue (RGB). The more shades of each of these colors, the more color variants the graphics card is capable of displaying. At lower color depths, fewer colors can be displayed on the screen, which means the subtler shades that appear in photographs and in your desktop icons have to be adjusted to the nearest shade that can be displayed in the color palette that your video card is set to display. The end result is that subtle gradients of yellow—for example, in that photograph of your cheese collection—get assigned a yellow from the limited palette, so your Gouda portrait makes it look like processed cheese slices. When this happens, it becomes harder to recognize what’s on the screen (see Figure 2). Figure 2. 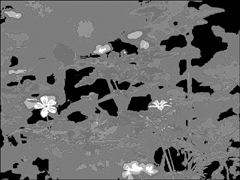 This is actually a photograph of some really nice flowers, but with the color depth set to 8-bit (and because we printed it in grayscale), it is barely recognizable. 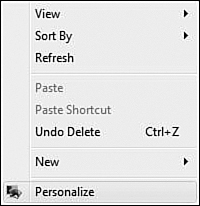 Right-click anywhere on an empty part of the Windows desktop and choose Personalize (see Figure 3). Figure 3. Right-click on the desktop and click Personalize to adjust your display settings. When the Personalization dialog box pops up, scroll down to the bottom and click on Display Settings. In Display Settings, look for the Colors option down at the bottom-right side of the dialog box. Underneath the Colors heading is a drop-down menu. The color depth of your system is listed in it as a number of bits (see Figure 4). Figure 4. Change the color depth of your system. Ideally, set this to 32-bit, if it’s an option. If your graphics card doesn’t support 32-bit as an option, choose 24-bit. If your screen resolution is too coarse to see the whole dialog box, just hit the Enter key. To change the color depth, click the drop-down menu and choose a higher value. Then click Apply. Your computer will make an adjustment to the color depth, and the picture may flicker or go blank briefly. When it resets, it should be much clearer, and you’ll be asked if you want to keep the settings. If so, click Yes. If not, click No, and the system will revert to the previous settings. If your graphics card won’t run at a higher color depth, you can make a slight improvement to the way Windows looks by changing to a more basic desktop theme that’s optimized for lower color depths. Click the top link for Window Color and Appearance. Under the Color Scheme submenu, choose another option from the list until you find one that looks good on your configuration. Click Apply to confirm your choice. If none of this works, or you only have 8-bit or 16-bit options for color depth, and you are unable to change your graphics using the steps detailed previously, you will have to update your graphics driver to get more color depth. Some older graphics cards with less onboard video memory might force you to choose between a higher color depth and a higher screen resolution. So when you bump up to 32 bits, it may drop the screen resolution, making screen elements larger and coarser.